Today, I am very happy to welcome a wonderful blogger to my space. Michelle Longo is a writer whom I met via NaBloPoMo in November 2013. Michelle has a unique style, a warmth which comes across through her candour and the way she uses words with a simple fluidity. 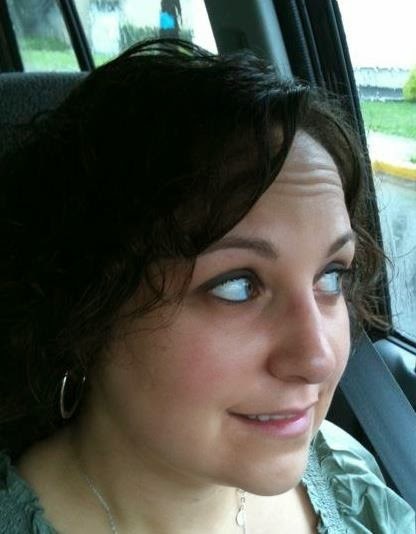 She blogs over at The Michelle Longo and is currently working on her memoirs. What makes Michelle even more special to me is the fact that I was introduced to Yeah Write through her where she is one of the editors. Yeah Write is a writer/ blogger support group, which takes its job very seriously. Aspiring writers derive great benefit from the weekly challenges and excellent support from fellow bloggers on the grid. Please welcome Michelle who will speak today on the necessity and need for minimalist living. Thank you, Michelle, for writing this post. Michelle Longo is a writer who lives with her husband and son in New Jersey. She blogs at The Michelle Longo. You can also find her on Facebook and Twitter. I wouldn’t exactly call myself a minimalist. One look around my house and you would say I’m not one. We own hundreds of books, many hundreds of DVDs, and probably over a 1,000 CDs. My husband’s comic collection is substantial and my seven year old son’s collection isn’t too shabby either. I have a hard time getting rid of paperwork and office supplies, and my notes from my work in progress form a substantial pile!We have two bedrooms, a home office, a living room, a dining room, an attic and a basement and all of it has a decent amount of stuff in it. I will say that I love the look of an empty room. Sometimes I think what drew me to this house, when we were looking to buy one, was that it was unoccupied and, as such, the rooms were pretty much empty. I love to see clear space, so I will admit I get a kick out of using up the food in the pantry and staring at the empty shelves I create. 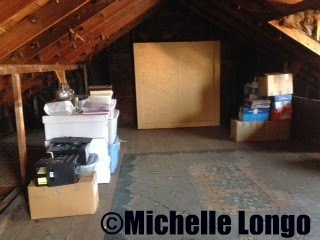 I recently sold most of what was in my attic and sometimes I sneak up there to stand in the open space, eager to have more of it. A few years back, I did a complete wardrobe overhaul. I emptied my closet and all of my drawers. I got rid of everything that didn’t fit, wasn’t my style, or was in disrepair. This left me with almost nothing. I loved how empty everything was and after replacing the important stuff, it finally dawned on me that I really don’t need the majority of what I have. I had been drawn to minimalism before that, but I think the experience with my clothes really made clear the idea that I’m happier when I don’t have things everywhere I look. I grew up in a house with a pack rat. My mother saved everything. In fact, when we were getting ready to sell her house in 2002, I found at least a dozen shopping bags filled with old electric bills. She saved every greeting card she ever received, every article of clothing she ever wore, and every lid to every food storage container, even if the container was nowhere to be found! I vowed I’d never live like that, but in the years that followed, I found it was much easier to save everything than it was to make decisions about what to keep and what to get rid of. In time, we ended up with a very full house. In 2010, my family of three moved from one house to another. I couldn’t believe the stuff I had saved over the years. Things from my childhood bedroom were still in the boxes I had stored them in, untouched. A storage bin filled with some of those old electric bills from my mother’s house had been in my garage for nearly a decade! Because my husband and I thought we might want another baby, I saved all of the baby items from my first child. Maternity clothes, clothes from my pre-pregnancy weight (and my pre-pregnancy career), toys, games, books… you name it, we had it saved in a storage bin. When it came time to move to the new house, I was overwhelmed by what we had. We ended up just putting it all in the attic and basement to deal with later. In the last year, I’ve made significant progress towards reducing what we own. People have told me that they wish they could clear out the clutter, but they don’t know where to start. I’ve learned a few things since I really focused on this project and I hope sharing them can help other people who are considering a similar journey. 1. Start with what you know you don’t need. For me, that was the baby stuff. We no longer intended to have another child, so everything my son had outgrown (books, toys, games, clothes, furniture) was sold or donated or given away. Seeing how much room we gained by not storing these items was a big motivator to keep going. 2. It doesn’t have to be all or nothing. You don’t have to go on a wild de-cluttering spree and empty your house in one weekend. Pick one area and work there. I started with my attic, but you could start with a closet or a drawer or any area where the easiest stuff to purge is located. Then, once you’ve cleared a space, no matter how big or small, don’t fill it up again. 3. Find a system that works for you. I love a good system. 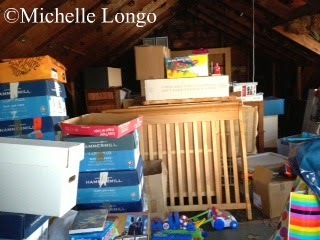 When I first started, anything that needed to be stored for donation or sale at a later time went in the attic. After my huge yard sale this spring, that area is almost empty. Now, my “staging” area is in my basement since that area hasn’t been cleared yet. This is just an example. Find a system that works for you so you can monitor your progress and not backslide. 4. Speaking of backsliding, don’t bring in more stuff. I don’t buy new things unless they are necessary. I don’t shop just for fun and I try not to add to what we have. I replace what’s broken and truly necessary, but we don’t keep what we don’t need. I find this to be most difficult in my son’s room, as it seems toys and things keep finding their way here. I’m working with my son to focus on the kinds of toys he really enjoys and passing on other items to kids who would enjoy them more. I keep his wardrobe to the necessities and we monitor his things regularly to keep from acquiring too much. 5. Find your motivation. I have two major motivators. The first, morbid as it may be, is that should the time come when my son has to go through my things because I’m no longer here, I don’t want him overwhelmed by the volume. I want to do that work for him along the way. The other, more practical motivator is the idea that if I have to move again, I don’t want to move as much as I did last time. Every time I consider storing an item, I ask myself if I want to have to move it to a new house, whether that’s in 1 year or 10 years. Usually the answer is ‘No’. It’s become apparent to me that I don’t need as much as society tells me I do. I want to be able to spend my time enjoying life, not cleaning or taking care of things. And I certainly don’t want to work so hard that I need more money to buy more space to store more things. Life is about making memories with those I love, not hanging onto the physical reminders of those things. In the months to come, I plan to continue getting rid of anything we don’t truly need so that we can truly enjoy the things we have. I loved this article, Michelle. I think it all comes down to how disciplined we really are. There's a difference in saving and hoarding and you did great by planning to sort out the clutter. I loved those tips. The same goes fro life as well, I guess. Anyhow, I loved it when you said “… getting rid of anything we don’t truly need so that we can truly enjoy the things we have”. Quite synonymous to life in general. I love the look of an empty room too. and of an empty closet. all the more fun to clutter it back up. I want to move into your attic. And I'm still waiting for you to come use your system here. I think this is very reasonable since many people today are on the move. They hardly stay at a place for long times.I love living rooms which has more space than furniture or decorative items.Thanks Michelle and Shailaja for this wonderful post. I love a good closet purge. Now that we're moving into a 500 sq foot teeny house, I'll definitely need to rid myself of more stuff. Lovely article Michell and such helpful advice. We recently shifted to a new home, our first, and I have been taking my own time to furnish it as I don't want to clutter with beautiful but in the long run unwanted items! I too love my empty spaces! 🙂 My wardrobe though definitely needs a massive decluttering exercise! 🙂 Thanks! I love an empty room. I have an office that I never use because when we moved in we threw everything in there that we didn't know what to do with. This post is motivation for me to tackle that room and get rid of everything! I think it really does take a tremendous about of discipline to keep the stuff to a manageable level. Some days we'll do better than others, but that's all part of the journey. Thanks for your thoughtful comment, Kajal! Well, it's really hot up there. But, if we make it into an awesome finished room, I'll let you know when it's ready to rent. Maybe I should start charging and I'll clean out all the homes in NJ as a professional organizer. You can be my first client! Thank you, Rajlaskmi! I agree about the living room area being better with less decor. I like the clean lines. I think when someone stays in a home for decades it's easy to forget about how much can accumulate. We've been in our current home for 4 years. I don't know how long we'll stay, but I'd love to be able to leave in an instant if a great opportunity arose! I would love to downsize into something smaller. I love the space we have, but I don't love cleaning it and I don't love that it invites things to accumulate. Someday, probably when Nathan is older and has a place of his own, I suspect Kris and I will move into a smaller place. Thanks, Beloo. I'm glad you found this helpful! I think minimalism creates this notion of people who live with nothing, but I like to think of it as a spectrum: Those on one end own very little, those who hoard on the other. All of us fall somewhere in between according to our own comfort. I have plenty of things I don't NEED to live, but they are comforts I'm not willing to give up. I think that's OK. Everyone gets to decide what works for them! Thanks, Aditi! When we first moved to this home, we bought new furniture for nearly every room since our previous home had mostly mismatched pieces from our first apartment. I know what you mean about how easy it is to fill up without really taking the time to consider what you'll love. Good luck in your new home! The sentimental stuff is definitely the hardest for me. I have stuff of my mom's and both of her parents who have passed away as well. And then all the artwork from my son is hanging around. That's most of what's in those bins in the after picture of the attic. What I did with some of the bulkier art projects as well as my trophies and awards from high school was to take pictures of them. This way they aren't taking up space in my attic, but I can still see them or show them to my son later. I really do believe it's not all or nothing and we all find our own way and our own comfort level. 🙂 Thanks so much for your thoughtful comment, Kathy! Loved it! I think when you de-clutter, you also usher in loads of positive energies in the area. That is one reason why I choose to de-clutter as much as I can. I couldn't agree more! Thanks for reading and commenting!